Soceita’ Dante Alighieri Comitato di Manila celebrates La Giornata della Dante (the Day of Dante) with a special film screening and literary discourses/talks on June 26, Sunday 2-5 PM at the U- View Theater, Fully Booked, Bonifacio Global City, Taguig. Parliamo Italiano: 1960s and the Italian New Wave examines the eventful 60s in Italian history when the country experienced a prolonged period of economic growth between the end of the second World War until the late 1960s . This era represented a cornerstone in the economic and social development of the country that was transformed from a poor, mainly rural nation into a major industrial power. This transformation brought about changes in the lives and dispositions of the working class and middle class Italians. For the laborers, it became a life of hard work, migration to the big industrial cities, away from their friends and family, and nostalgia for the simple life in the country. On the other hand, the middle class’ introduction to the bourgeoisie lifestyle eventually lead to boredom, a lack of empathy and feeling, and a lifestyle based on the consumer society’s penchant for immediate pleasures and lust. The disparity and general feelings of these two distinct classes are mirrored in the era’s most prominent literature and films. Parliamo Italiano introduces an in depth examination of the 60s Italian societies through a talk/discourse of literary masterpieces, Marcolvaldo by Italo Calvino (1963) and La Noi by Alberto Moravia (1960). Marcovaldo narrates the story of Marcovaldo, a poor rural man turned laborer for a big industrial company in the northern city of Italy. His distaste for city life and nostalgic reflections of his simple life in the country is told through a series of stories set in every season of the year. La Noi (Boredom) is considered to be Alberto Moravia’s most popular novel. This masterpiece is a story of a troubled sexual relationship between a young rich painter looking for sense in life and an easy-going lady from Rome. The story talks about the moral aridity and the hypocrisy of contemporary life common amongst the middle class. 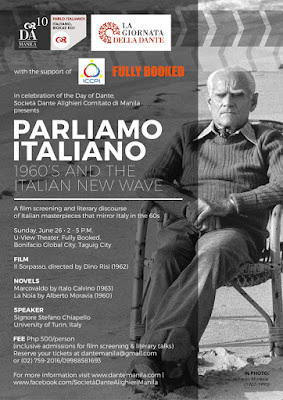 Parliamo Italiano will also include a special film screening of the classic, Il Sorpasso directed by Dino Risi in 1962. This film favorite is the ultimate road comedy movie starred by Vittorio Gasman and Jean-Louis Trintignant as characters with opposite personalities join together in a mad-cap trip from Rome to idyllic Tuscany. The film which transitions from slapstick to tragedy is a wildly entertaining commentary on the pleasures and consequences of the good life. The event will be lead by Signore Stefano Chiapello from the University of Turin in Italy. Admissions to the event is P500 inclusive of the talks and the film screening. Societa Dante Alighieri Comitato di Manila partners with the Italian Embassy in Manila in promoting the Italian culture in the Philippines. It spearheads various language programs and cultural events that bridge the Italian and Filipino cultures. It offers Italian language courses and translation services to Filipinos who want to learn more about the Italian culture through the language. Parliamo Italiano: 1960s and the Italian New Wave is organized by Societa Dante Alighieri Comitato di Manila with the support of the Italian Chamber of Commerce and Fully Booked. For inquiries and reservations, email dantemanila@gmail.com or call (02) 759-2016/ 09988981693. Societa Dante Alighieri Comitato di Manila is located at Zeta Building, Salcedo St. Legaspi Village, Makati. Visit their website at www.dantemanila.com or check updates through http://www.facebook.com/SocietaDanteAlighieriManila.